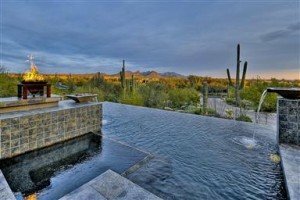 Sincuidados in north Scottsdale, Arizona is a private community tucked into the high Sonoran Desert with panoramic views of Lone Mountain, Pinnacle Peak and Troon Mountain, making it the perfect place for any discriminating home buyer. Sincuidados features a luxurious clubhouse, lighted tennis courts, private streets, 24 hour roaming security, and more. Sincuidados has access to trails within the Mountain Preserve, including 40 acres donated by resident and philathropher H.B. Wallace and the Wallace Botanical Garden. More than 70% of Sincuidados falls under the Natural Area Open Space (NAOS) category. This well-preserved land features and excellent look at local cacti, plantings, and desert life. Homes in Sincuidados range from modestly chic to large luxury estates. All homes in the community feature a Territorial or Santa Fe style architecture, each with its own special character and gorgeous mountain-views. Owning a home in Sincuidados offers you a tranquil worry-free lifestyle. What the community offers is in the name itself. “Sincuidados” in Spanish, translates to “without cares”. Experience Sincuidados in Scottsdale, Arizona and experience the beauty of the Southwestern living.